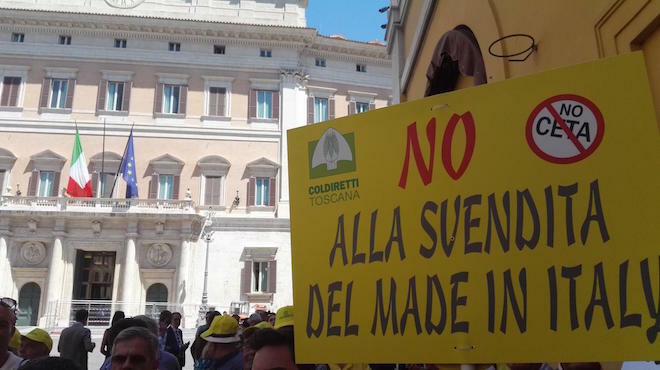 ROME, May 18 (Xinhua) — Italy’s populist Five Star Movement on Friday posted online a final version of its so-called "contract" with the rightwing League, outlining how the two forces plan to govern Italy. The two parties are the relative winners of Italy’s March 4 general election, and have been in power-sharing talks. The final document watered down more radical proposals contained in earlier versions, which suggested Italy should leave the eurozone and asked the European Central Bank (ECB) for a debt haircut of 250 billion euros to pay for generous public spending and drastic tax cuts. The 57-page, 30-point final version calls for "inducing the European Commission to separate public investments from the current account deficit" and "re-discussing EU treaties" on deficit reduction. It introduces a 15-20 percent flat tax for individuals and businesses and scraps an unpopular pension reform introduced as a cost-cutting measure in 2012. It introduces basic income of 780 euros (about 918 U.S. dollars) a month, to be paid for with European Social Fund (ESF) funding, according to the contract. On the foreign policy front, the document opposes international trade treaties such as the EU-Canada Comprehensive Economic and Trade Agreement (CETA) and the Transatlantic Trade and Investment Partnership (TTIP), and calls for scrapping sanctions against Russia, calling it "a strategic talking partner in solving regional crises (Syria, Libya, Yemen)." As well, the "contract" calls for deporting 500,000 undocumented migrants, hiring more police and prison guards, introducing the right to self-defense at home and on the job, tougher prison sentences for rapists and white-collar criminals, and building more prisons. Five Star supporters have been called on to vote on the contract online through 10 p.m. local time on Friday, while the League is submitting it to its own voters at stands set up in public places throughout Italy on Saturday. Five Star leader Luigi Di Maio and League chief Matteo Salvini have said they would not go ahead without approval from their respective grassroots. If the votes are positive, the next step would be for the two leaders to report back to President Sergio Mattarella, paving the way for the head of state to appoint a new prime minister. That meeting could take place on Monday, local media report. This means a full government could be sworn in sometime next week, to be followed by a vote of confidence in parliament. Meanwhile, Italy’s borrowing costs continued rising Friday, because a Five Star-League government would have to borrow large amounts of money to carry out its program. This would drive up Italy’s public debt, which is the second-highest in the eurozone after that of Greece, and which topped 2.302 trillion euros in March, according to the Bank of Italy. The spread between Italy’s 10-year government bonds and their German counterparts, a key measure of borrowing costs, rose to 160 basis points in afternoon trading (up from 130 points earlier in the week). The higher the spread, the lower the investor confidence. Italy’s debt-to-GDP ratio stood at 131.8 percent at the end of 2017, compared to 64.1 percent in Germany and 97 percent in France, according to EU statistics agency Eurostat.